Today I have a Technique Class to share with you that teaches you a couple of different ways to use the Resist Technique. My favorite stamp set from the Spring Occasions catalog is Sheltering Tree. I love the versatility of this set and the majestic tree. You can stamp the image and make the tree look casual or very regal. Each month I develop a class that members of my Stamper’s Club receive for FREE as part of their monthly membership. One of my stamp club members asked me to teach a class on Resist techniques. So I used the Sheltering Tree set and developed several different cards using variations of the Resist Technique. The next logical thing to do was to video these techniques and put a class together to share with the rest of the world. So here it is! 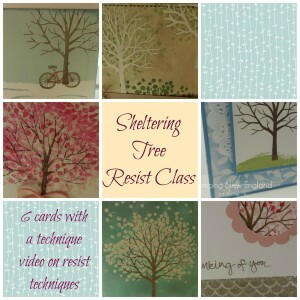 This class includes a Video demonstrating 4 different variations of the Resist Techniques. Included is a color PDF with full detailed instructions for 7 cards using the Sheltering Tree stamp set. The cost of this class is $25 and you will have lifetime access to the class and video. Ready to learn the Resist Technique?? You can purchase access to the Class here.